Smooth, flawless skin, youthful cheeks and lips –some people already have them naturally, but others will need some cosmetic help in the form of fillers to get the desired contour and shape. Facial or dermal fillers offer a safe and easy non-surgical procedure, to help you achieve a more rested appearance with youthful contours to the face. If you’re curious about fillers, we’ve answered the most important questions our patients ask when inquiring about injectables. While collagen used to be the commonly administered filler, hyaluronic acid fillers are the new injectables of choice. Hyaluronic acid is a natural skin substance that stores moisture in the skin. By replenishing it, skin will have more volume and the appearance of lines and wrinkles become diminished, giving patient’s natural-looking results. 2. What is the Difference Between Botox and Dermal Fillers? Botox and alternatives like Jeuveau, Xeomin and Dysport are not fillers, but neuromodulators used to treat wrinkles that naturally occur around the eyes, mouth and in between your eyebrows. As these lines become more pronounced with age, Botox can be used to relax the muscles that cause them. Since the injected muscle can no longer tighten and contract after treatment, wrinkles will then relax and soften. Dermal fillers, on the other hand, add volume to the depressions around the corners of the mouth, lips, temples, chin and cheekbones, while enhancing facial features. Once injected, it will replenish your natural hyaluronic acid, which diminishes as you age. Fillers will give your skin a plump, smooth, hydrated look and can work in tandem with Botox to rejuvenate the face. 3. 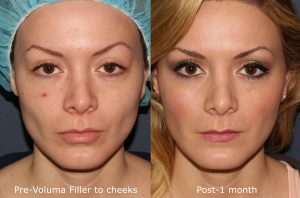 What are Some Examples of Dermal Fillers? Each product is formulated to create a certain texture, depth and density –meaning, certain fillers will work better for certain areas you want to enhance. Your doctor should be able to determine what product is best for your needs. 4. What Does the Treatment Involve? Aside from evaluating your area(s) of concern, your doctor will review your medical history since skin conditions, allergies and medications can impact your safety as well as the results. For instance, NSAIDS such as ibuprofen and aspirin, as well as blood thinners, can increase the risk of bruising. Your doctor, sometimes accompanied by a specially-trained nurse, will then evaluate your face in order to examine the specific areas to be injected. Strategic points may be used in order to mark injection sites. Cosmetic Laser Dermatology is one of the few practices in San Diego in which the doctors perform all injections themselves. The marked injection sites will be cleaned using an antibacterial solution. A cold instrument can be applied to the skin in order to numb it. Anesthetic ointment or local anesthesia, while rarely necessary, may be administered as well. Most filler products, however, contain the anesthetic lidocaine that can help minimize discomfort. Injection of fillers will only take a few seconds per site. The doctor will inject a precise amount of filler beneath the skin, massage it, evaluate the results and may use additional fillers as needed. Mild discomfort can be expected. And depending on the number of areas to be treated, the entire procedure can last between 5-30 minutes. You will be able to go back to your normal activities after the procedure. 5. How Long Will Dermal Fillers Last? 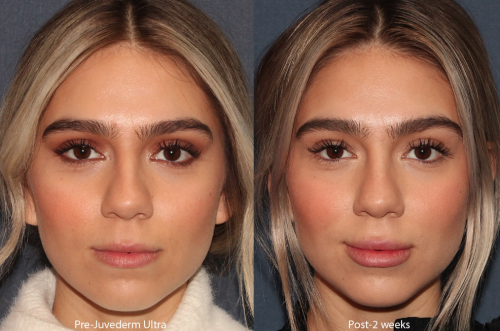 The effect of most fillers are immediate but it can take up to 2 weeks for final results to appear as some filler cause a bit of temporary swelling Depending on the type of filler used and the area, results can last between six to 18 months or longer. How long a filler lasts is also dependent on the type of filler used, amount of product used, the location the filler is placed and your metabolism. Fillers also tend to last longer on areas that move the least. For instance, injected cheeks will likely last longer than enhanced lips. While severe side effects, such as injection into an artery causing a skin ulcer or blandness are exceedingly rare, most minor side effects will usually go away within a few hours to weeks. Some minor side effects include redness, numbness, bruising, allergic reaction, itching, scarring and sores. Ice packs can be used to help relieve swelling and numbness. 7. Are Dermal Fillers Considered Safe and Effective? Hyaluronic acid is actually a “water-loving” molecule found naturally within the body. Dermal products containing HA provide safe and natural-looking results. 8. Who is Performing The Injections? Dermal filler treatments should be done by a qualified and registered medical doctor, or a nurse under the supervision of a doctor. Here at Cosmetic Laser Dermatology in San Diego, board-certified dermatologists always perform the injections. 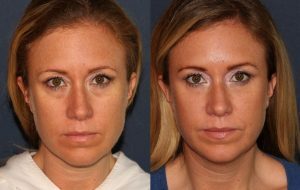 Some of our physicians have been performing filler injections for over 35 years without any significant complications! 9. How Do I Choose A Doctor? When selecting a doctor for your injectable treatment, give your decision-making process the same level of review you would for a surgical procedure. Although it is non-surgical, a dermal filler treatment is a medical procedure that requires knowledge, skill and training in order to ensure safe and positive results. Choose a board-certified doctor with an extensive knowledge of facial anatomy and aesthetics. He or she must have a background in cosmetic medicine, as well as substantial experience in performing dermal filler injections. 10. Are There Rewards Available with Follow-up Filler Treatments? Yes, there are loyalty programs available with certain fillers. For example, there is the Galderma Aspire and Allergan Brilliant Distinctions loyalty rewards programs available which allows patients to earn points to use towards future treatments, bonuses and more. With the help of a qualified provider, dermal fillers can produce natural-looking results that will help you look younger and feel more confident. If you’d like to explore your options, or learn more about injectables, contact our board-certified cosmetic dermatologists at Cosmetic Laser Dermatology, San Diego. Schedule a consultation by contacting us online or give us a call today at 858.943.2113.